Chiritorie is a microgame found in the Nintendo Classics folder in WarioWare, Inc.: Mega Microgame$! It returns in WarioWare Gold, where it is hosted by 18-Volt. The microgame involves the remote control vacuum toy Chiritorie, one of the several creations of Gunpei Yokoi. 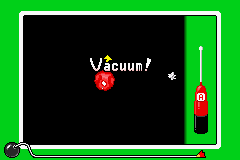 The objective of the game is to clean up all of the pieces of trash by using the Chiritorie vacuum. The Chiritorie will spin with an arrow indicating the direction it is pointing. Holding down will make it accelerate in the direction it is facing. It will bounce off walls. 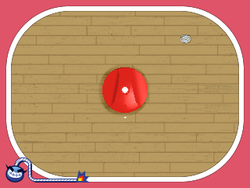 In WarioWare Gold, the Chiritorie is controlled by twisting the 3DS. 1st level difficulty: One piece of trash. This page was last edited on March 9, 2019, at 13:38.